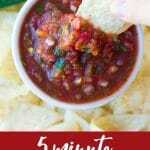 Learn how to make restaurant style salsa in just 5 minutes! A ridiculously easy blender recipe with incredible flavor. This may just become your “go-to” salsa recipe and you’ll surely impress anyone you make it for! Perfect for tortilla chips, Mexican bowls, burritos, or even served on baked potatoes. 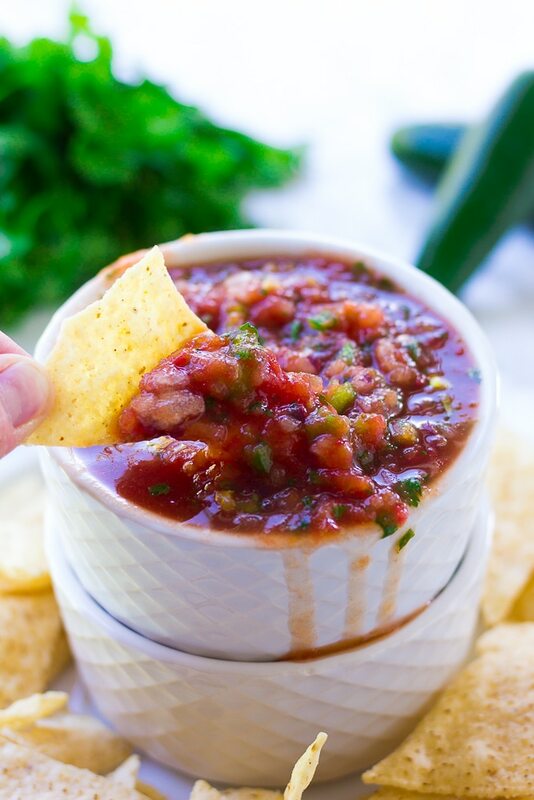 Are you ready to learn how to make the best homemade, restaurant style salsa ever? This vibrant dip is bursting with fresh flavor and comes together in about 5 minutes. Jarred salsa is, eh, okay sometimes, but after tasting the homemade, fresh version it’s really hard to tolerate it anymore! I like this SO much better than anything I can buy at the store. Plus, it’s customizable. Don’t like cilantro? Leave it out. Want more of a spicy kick? Leave some of the jalapeno seeds in. More salt, less salt? Adjust to your personal tastes. 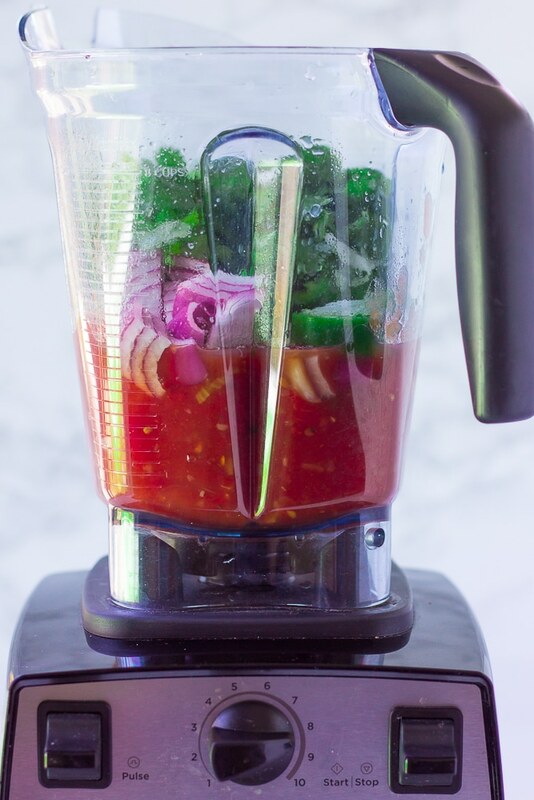 My favorite way to make this restaurant style salsa is in my Vitamix with the “pulse” feature. If you don’t have a high powered blender, I’d recommend a food processor, though a regular blender will work as well, just make sure not to over blend. 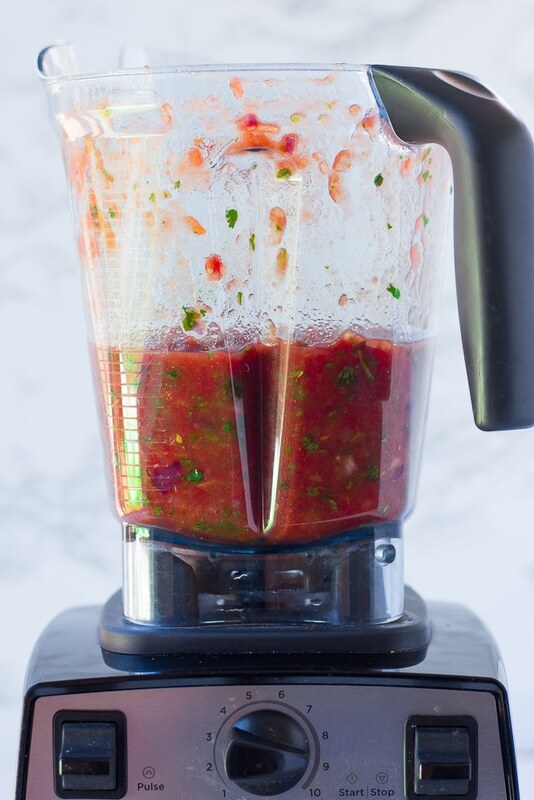 Simply add all the ingredients to your appliance of choice, and pulse or blend a few times, until you have a smooth salsa. You can leave some chunky texture if you prefer and blend/process less, or make it very smooth, your choice. I like mine pretty smooth but not over blended. Can I use fresh tomatoes instead of canned for restaurant style salsa? You can certainly use fresh tomatoes in place of the canned if you prefer, or have an overabundance of tomatoes growing in your garden. Replace the canned, fire roasted tomatoes with about 3 cups of fresh ripe tomatoes, perhaps quarter them before adding the the blender/processor. I’ve made this recipe with fresh and canned tomatoes, and they are both amazing. 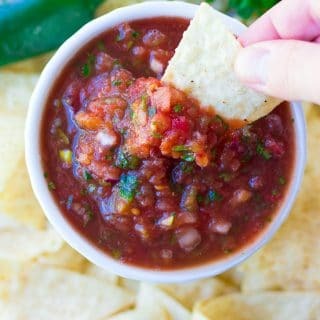 I just usually find it easier to have canned tomatoes on hand, and this way the salsa recipe is easy to make year round even when tomatoes are out of season. 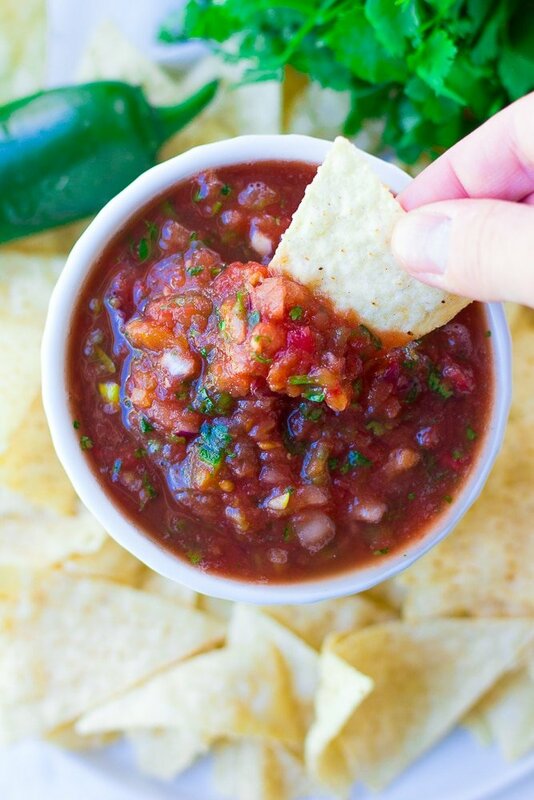 Learn how to make restaurant style salsa in just 5 minutes! A ridiculously easy blender recipe with incredible flavor. This may just become your "go-to" salsa recipe and you'll surely impress anyone you make it for! Add all ingredients to a blender (food processor would work as well). Pulse and blend a few times or until you reach desired consistency. It won't take long, maybe 30 seconds to 1 minute. Taste the salsa, and based on your personal preference, adjust ingredients as necessary. Add more salt, cilantro, or perhaps more jalapeno if desired. Transfer to an airtight container and store in the fridge until serving. Serve with tortilla chips, in burritos, Mexican bowls or anywhere else you enjoy salsa. I like Muir Glen Diced and Fire Roasted Canned Tomatoes the best for this salsa. I can usually find them even at Wal Mart. You may also use any other high quality canned diced, plum or stewed tomatoes. Or go fresh and use about 3 cups of fresh ripe tomatoes instead!